Robbie McNamara claimed his second victory at this year's Cheltenham Festival when making all the running to win this amateurs' chase on Spring Heeled. McNamara, who won yesterday's Weatherbys Champion Bumper on Silver Concorde, wore the same colours of Dr Ronan Lambe for today's win. It was a good omen for trainer Jim Culloty, who runs Lord Windermere in tomorrow's Betfred Gold Cup. Culloty said: "That was unbelievable. I've always thought the world of this horse, but he was a bit fractious as a youngster and as a result of that and me giving him time he's ended up a well-handicapped horse. There were 24 runners and I knew things had to fall his way, but if they did he would have a right chance. "There was no luck needed, because when he jumped the first and gained a lovely soft lead, and had the right jockey on his back, you could call him the winner from there. When I schooled him as a young jockey he was exceptional over a jump, and after I mentioned that to Dr Lambe he called him Spring Heeled. 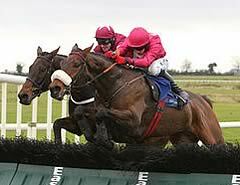 "This year's aim all along has been the Irish Grand National and Cheltenham was a bit of an after thought. It was in mind if the weather improved and the ground dried up so we came and it's worked. I'm thinking he could be a horse for Aintree next season. "Our horses are back to form and have been wrong, so I've hardly had a winner for six months, but this is a good omen. Lord Windermere has travelled over brilliantly and everything seems to be coming right so fingers crossed." The successful rider said: "I was happy to lob away in front and he jumped from fence to fence. I felt he would battle on from a long way out and it was going to take a good one to come and get him. "I could hear the runner-up when he clouted the last so I knew there was something on my tail, but my horse jumped a lot better than he did last time and the better ground seems to have suited him. I had it in the bag a long way out. "Jim was very confident - he blamed the ground last time and fancied him big time. Yesterday my first winner at the Festival was a relief - I've been trying for a long time to ride a winner here, and while I have had loads of seconds and thirds I wasn't going to be riding for ever. I'll never forget that win but this is lovely too." A terrible blunder at the final fence cost runner-up Cause Of Causes victory according to trainer Gordon Elliott, but he was still very pleased with the performance of the six-year-old this afternoon. The 13/2 shot looked like he was coming to win the race under Nina Carberry as the field approached the final fence but his chance was over after a shocking mistake which left Spring Heeled clear. The J P McManus-owned gelding battled back well following the blunder but couldn't quite reel in the winner, eventually going down by a length and three quarters. Elliott was in a reflective mood afterwards and was left wondering what could have been. "He's run grand race but that mistake has cost us," said the trainer. "He definitely would have won I reckon. It's a shame but Nina (Carberry) has done a great job in staying on." Roberto Goldback stayed on strongly to take third place at the death, a further 17 lengths behind the runner-up. Trainer Nicky Henderson was happy enough with his performance and there will be other days for the 12-year-old. "He stayed on strongly and it was a nice run," said Henderson. 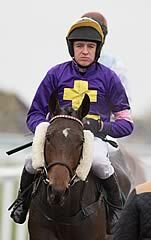 "We didn't enter him in the Crabbie's Grand National because he didn't seem to enjoy it last year (when unseating). It's a shame really as he's run a good National trial there."